As we pump billions of tons of carbon dioxide into the atmosphere, we're doing more than warming the planet and scrambling the climate. We're also conducting what climatologist James Hansen has called a "vast uncontrolled experiment." In effect, we're on our way to engineering a world very different from the one we were handed. Belatedly, we're trying to turn off the carbon spigot, hoping that by incrementally reducing the emissions we've spent a couple of centuries pouring into the air we can stop the climate slide before it's too late. But what if we can't do that? What if it turns out that slashing carbon emissions enough to make a difference  and it seems that means cutting output at least in half by midcentury  is economically and politically impossible? Do we need a Plan B? A small but growing number of researchers are beginning to say yes. If we geoengineered the earth into a mess with our uncontrolled appetite for fossil fuels, maybe we have to geoengineer our way out of it  in effect, directly cooling the planet via a controlled experiment to counteract our uncontrolled one. Indeed, according to a just-published paper for the Copenhagen Consensus on Climate  a think tank studying inexpensive solutions to climate change  geoengineering might not only be a good way to bring rising temperatures under short-term control while we wait for the longer-term fix of cutting carbon emissions to take hold, it might be the only way. "The potential benefits of geoengineering are really very large," says Lee Lane, a fellow at the American Enterprise Institute and a co-author of the paper. There are a number of potential approaches to geoengineering, but the most popular ones focus on controlling the amount of solar radiation that reaches the earth's surface. Climate  in its simplest terms  is the rough relationship between the amount of solar energy that strikes the earth and the amount that is retained by the atmosphere, as opposed to being radiated or reflected back into space. In this sense, the greenhouse effect is not all bad. 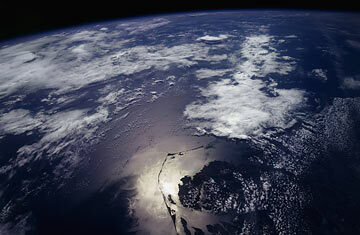 Without a little bit of it, the earth would be a cold, dead place, with an average temperature as low as -0.4°F. Unfortunately, by adding CO2 and other greenhouse gases to the atmosphere, we have, in a sense, thrown another quilt on the planet when we were perfectly comfortable to begin with. One way to turn down the thermostat would be to spread sulfur particles into the atmosphere, either through artillery or with airplanes, thickening the air enough so that it would bounce some sunlight back. We know that process does reduce global temperatures: when Mt. Pinatubo in the Philippines erupted in 1991, it threw millions of tons of sulfur dioxide into the atmosphere, causing global temperatures over the following months to drop by nearly 1°F. Geoengineering would work much the same way  only it would need to be done continuously, to keep up with the intensifying greenhouse effect. Other methods include spraying seawater mist from ships toward low-lying clouds, which would then reflect more sunlight. Another more extreme but oft-discussed option would involve putting mirrors into the earth's orbit. If those ideas have the disadvantage of sounding convoluted, they have the real advantage of being cheap  at least in relative terms. According to the new paper by Lane and J. Eric Bickel of the University of Texas, the seawater-mist method could counteract a century's worth of warming for $9 billion. Compare that to the political complexity and the economic unknowns associated with a meaningful and enforceable global climate accord. "The benefits are so great, at a low cost, that at the very least it makes sense to invest in a real research program for this," says Lane. But before we start creating man-made volcanoes, we should worry about the side effects. For one thing, increasing sulfur in the atmosphere would increase acid rain, with all the damage that can do to forests and wildlife. And there are serious concerns that artificially changing cloud cover could disrupt global precipitation patterns, a risk that climate scientists Susan Solomon and Gabriele Hegerl raised in a recent article in Science. They found a global drop in precipitation levels after the eruption at Mt. Pinatubo, and an increase in droughts. A cool but dry planet wouldn't be an upgrade from where we are now. "Climate change impacts are driven not only by temperature changes, but also by change in other aspects of the climate system, such as precipitation and climate extremes," they write. That's a powerful criticism: it's hard enough for scientists to predict what's happening to our climate now, and it would be even harder if we start fiddling with it further. But worst of all might be to take only the safe and slow approach and watch the climate collapse around our ears. We're already geoengineers, after all; we might as well get good at it.